Today, when you order "Card On Ceiling (Worlds Greatest Magic)", you'll instantly be emailed a Penguin Magic gift certificate. You can spend it on anything you like at Penguin, just like cash. Just complete your order as normal, and within seconds you'll get an email with your gift certificate. Order in the next 12 hours 6 minutes and it will ship TODAY! If you could have one set of magic DVDs, this would be it! This benchmark collection features just about all of magic?s most enduring and classic effects and routines. 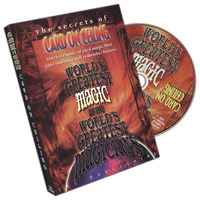 It's a fabulous compendium with many of the top masters in the world of magic teaching their handlings and routines for some of magic?s classics. Linking rings, sponge balls, metal bending, cups and balls, thumb tips, Zombie, color-changing knives, and many, many more topics are all gathered in this one terrific DVD reference set. Each volume covers a specific subject and features new, old, and sometimes rare footage by some of the top video producers in magic. In the early part of the 20th century, legendary bar magician Matt Schulien threw a deck of cards against the wall of his tavern and left a spectator's selection stuck in place. Little did he realize that he had created one of the most memorable and dramatic card tricks of all time. Since then, magicians have aimed their sites a little higher ? ceilings, to be exact ? and have been amazing and mystifying audiences with one of the very few card tricks that has such a huge, built-in "wow" factor. On this volume, you'll meet five modern-day practitioners who have all made important contributions to the evolution of the Card On Ceiling. Doc Eason shows you how to make this trick play for large groups, drawing in all of the spectators into this very magical experience. You'll learn all of the fine touches in J. C. Wagner's version of the trick that's used by bar magicians everywhere, including Doc Eason. Karl Norman performs and discusses the version that he performed for 40 years at the legendary Forks Hotel and Michael Ammar teaches his take on this classic effect, one that helped to forge his reputation in the world of magic. Lastly, Scotty York, in addition to his very funny and clever presentation of this trick, will demonstrate how to make a gimmick that will enable you to streamline its handling. 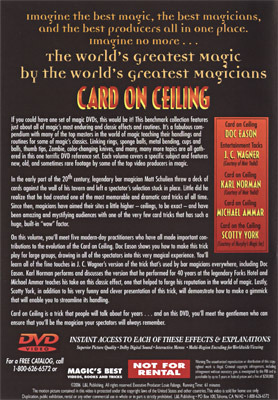 Card On Ceiling is a trick that people will talk about for years... and on this DVD, you'll meet the gentlemen who can ensure that you'll be the magician your spectators will always remember. I absolutely love this trick! very clever and i cant wait to start preforming to the public with it because it looks amazing in the Mirror. Sean fields does an amazing tutorial and i would highly recommend this to any magician who wants to do the impossible. However I think this trick could be a lot better if some of the required things were included for example the blood. But other than that no issues with it at all. Kind of annoyed with the 3 star review of the trick. I learned this trick in Sean Field's Sickness Trilogy, so I am not sure how different the teaching in this is from that DVD. However, the trick is indeed brilliant and the method is straight forward. It is not difficult nor complicated. It does require some set up beforehand. At first, the set up can take a bit, but once you have performed the trick several times, it gets easier and quicker. Also, be aware that you do need a separate gimmick for this trick but that gimmick can be bought at any magic shop. 1 of 8 magicians found this helpful.